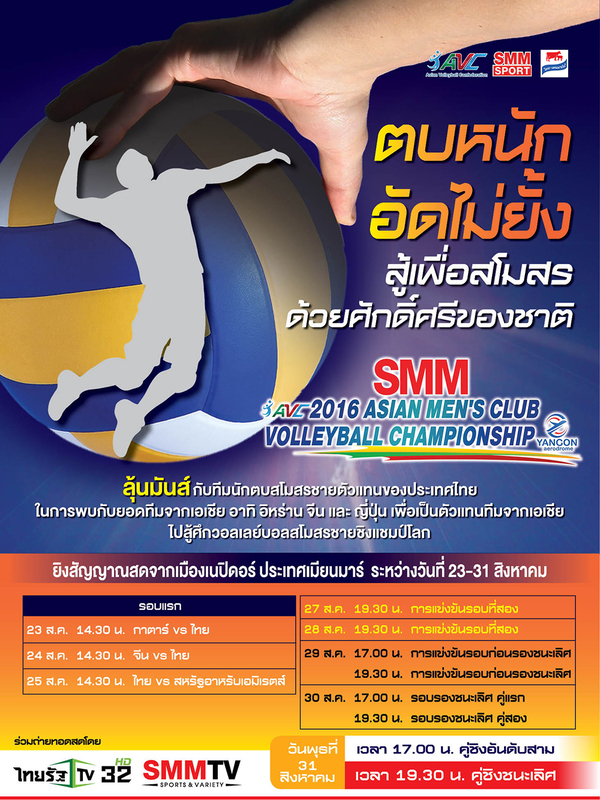 Nay Pyi Taw, Myanmar, August 17, 2016 – Myanmar will host the SMM 2016 Yangon Aerodrome Asian Men’s Club Volleyball Championship, which is scheduled between August 23 and 31 in Nay Pyi Taw, with 15 teams testing their mettle for the top of the podium. 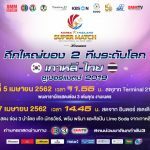 All participating teams have been split into four pools to contest the group round-robin preliminaries consisting of Pool A, Pool B, Pool C and Pool D.
Hosts Myanmar, Turkmenistan’s Nebitchi, and Vietnam’s Maseco are in Pool A, while Pool B features Indonesia’s Surabaya Samator, Japan’s Toyoda Gosei Trefuerza, Iraq’s Gas Aljanoob and Chinese Taipei’s Taiwan Power. 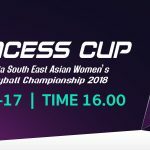 Pool C consists of the UAE’s Al Jazira, Qatar’s Al Arabi Sports Club, Thailand’s Wing 46 Toyota-Phitsanulok and Shanghai Golden Age from China, with Malaysia, Iran’s Bank Sarmayeh, Kazakhstan’s Altay VC and Lo Kon Ting Volleyball Association (LKTVBA) from Hong Kong in Pool D.
The pool preliminaries will be held from August 23 to 25. August 26 will be the rest day, while the intense competition will resume on August 27 and run through August 31, with teams pitted in the quarter-finals, semi-finals and the finals. Only top two teams from each pool in the preliminary round will advance to compete in the quarter-finals in Pools E and Pool F, while teams finishing third and fourth from each pool will be relegated to the 9th-16th classification round . The finals will be held on August 31. The awards presentation and closing ceremony will take place shortly after the final showdown. The eventual winners of the prestigious tournament will represent Asia at the FIVB Volleyball Men’s Club World Championship at Belo Horizonte and Betim in Brazil. 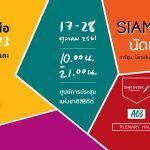 The tournament will kick off on August 23 with all participating teams taking part in the opening ceremony at 10am local time, followed by the curtain- raisers between Maseco and hosts Myanmar in Hall B and Surabaya Samator against Taipei Power in Hall C at 11.30pm. 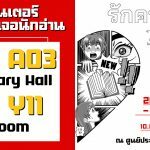 The other matches in Hall B see Al Arabi Sports Club face Wing 46 Toyota- Phitsanulok, Al Jazira meet Shanghai Golden Age, while at Hall C, Toyoda Gosei Trefuerza take on Gas Aljanoob, Malaysia play Lo Kon Ting and Bank Sarmayeh battle against Altay VC. Since the tournament‘s initiation in 1999, Iran has been the most successful country with 10 titles, followed by South Korea with two titles. Qatar, Kazakhstan, China and Chinese Taipei have one title apiece. 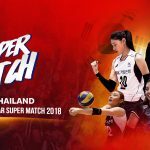 At the previous edition in Chinese Taipei last year, hosts Taichung Bank captured their maiden victory after defeating Al Arabi of Qatar 3-1 before their home crowds. Iran’s Paykan Tehran finished third place after thrashing Pavlodar from Kazakhstan 3-1.